Was seduced by a basket full of florals that just kept talking to me so ignored what i should have done today and started playing. 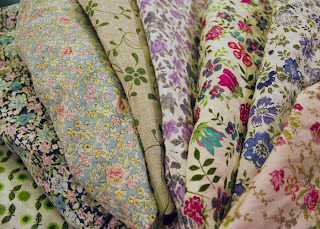 We do spend a lot of time playing.... as i'm sure most would when faced with such yummy fabrics....... the hardest thing is deciding what to make from them. These delicate beauties (4 of which are liberty tana lawn salvaged from blouses) are destined to be born again into... amusingly.... blouses for Flora (our gardener doll). Have chosen and cut linen and corduroy to complement for her trousers. Hope we can do the fabrics justice. Flora was originally created in 2003 for a Spring show and she has appeared in many diffferent colours. We love to individually design each doll and vary them each time. Doing 10 the same just wouldn't be fun now would it? Looking forward to having Alice back in the studio on Thursday after an extended break. I do miss her fun and energy. We seem to inspire each other and it's great to have the company and someone to bounce ideas off. In my 'previous life' I made costumes for theatre and dance and worked from home.... It was often quite isolating. I wish the blogging world had been around then!..... i love the friendliness and openess of support and sharing of ideas. I'm still very much a beginner at this and any feedback on these first posts would be greatly appreciated. Also it'd be great to know if anyone has found this blog yet!